“As a brand, Converse owes a lot to music. A lot of our success today is from how music and culture have adopted our sneakers,” said Converse global music marketing director Jed Lewis. Before the Pixies roared into T.T. the Bear’s by surprise last week, the biggest music news out of Boston this year came from an unlikely source: a company best known for its sneakers. In April, Converse put a big dent in the local live-music landscape when it announced a five-night festival of free concerts at the Sinclair in Cambridge. Except the lineups weren’t quite scaled to the 525-capacity club. They were full of heavyweights, from the Replacements and Passion Pit to Slayer and Chance the Rapper. The shows, which attracted full houses of fans who scored tickets through a random electronic lottery, sent a strong message: Converse intends to be a major player in Boston’s music community. 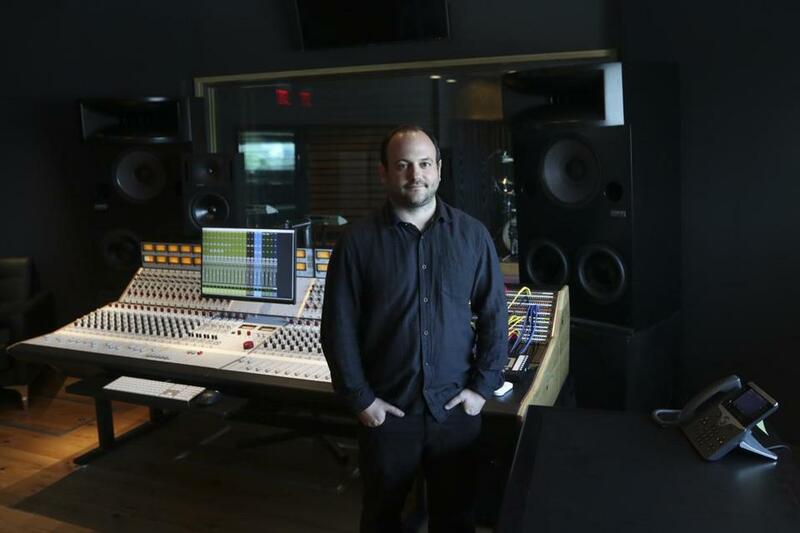 The company will build on that momentum on July 1, when it opens its permanent Converse Rubber Tracks recording studio adjacent to its gleaming new world headquarters on Beverly Street along Lovejoy Wharf at the edge of the North End. The studio will invite bands of all genres and hometowns to apply for an offer that sounds too good to be true: You show up with an idea of what you want to accomplish, and eight hours later you leave with your progress, typically on a hard drive. There are no fees, no long-term commitments, nothing in return for Converse. It’s one full day of free studio experience, no strings attached. “As a brand, Converse owes a lot to music,” says Jed Lewis, its global music marketing director. “A lot of our success today is from how music and culture have adopted our sneakers. We really wanted to start giving something back, some way to say thank you. The company especially wants to nurture new bands that perhaps haven’t recorded in a professional studio yet, or maybe don’t even own the best gear. In addition to guidance and feedback, Rubber Tracks will have instruments on hand for bands to use. Goals have ranged from establishing the bones of a song to walking out with a completed track to knocking out a full album’s worth. It’s up to the bands. Last week, Lewis and the Rubber Tracks Boston staff gave the Globe a private tour of the new facility . Everything was pristine: hardly a fingerprint on the soundboard, shiny wood floors, smudge-free windows that looked out onto picturesque Zakim Bridge. It had a new-car smell about it, from the main studio space that faces the control room to an isolation booth that seals with two sliding glass doors. Aside from some test runs, no one had recorded a full session there yet. Lewis says the Boston staff will sort through the applications, looking for bands dedicated to their craft, but also engaged with their audiences through social media and live shows. And they want to curate as many genres as possible coming through the studio. It’s also a chance for Converse to honor the state where it all began. The company was founded in 1908 in Malden, and until recently had been based in North Andover. The new headquarters is a massive complex, sprawling over 200,000 square feet. This is the third such permanent studio for Converse Rubber Tracks, which opened a location in Brooklyn, N.Y., in 2011, followed by one in São Paulo last year. (The company also hosts pop-up sessions at studios around the world.) It’s an extension of Converse Rubber Tracks Live, a series of free shows that routinely happen at the Sinclair, including Thursday night’s performance by indie-dance duo Matt and Kim. Before the Boston studio even opened, Converse was already championing local bands with pop-up studio sessions at Q Division in Somerville. R&B-funk party band Bad Rabbits recorded at one of them, as did hip-hop artist Michael Christmas, indie rockers Bent Shapes, and moody electro-pop act Radclyffe Hall, who laid down two songs that will appear on its next EP. She’s referring to the fact that for Converse’s five-night festival in April, the series invited Boston bands who had previously recorded at Rubber Tracks to be the opening acts. Berry says there really is no fine print to the company’s support and generous offer. James Reed can be reached at james.reed@globe.com. Follow him on Twitter @GlobeJamesReed.